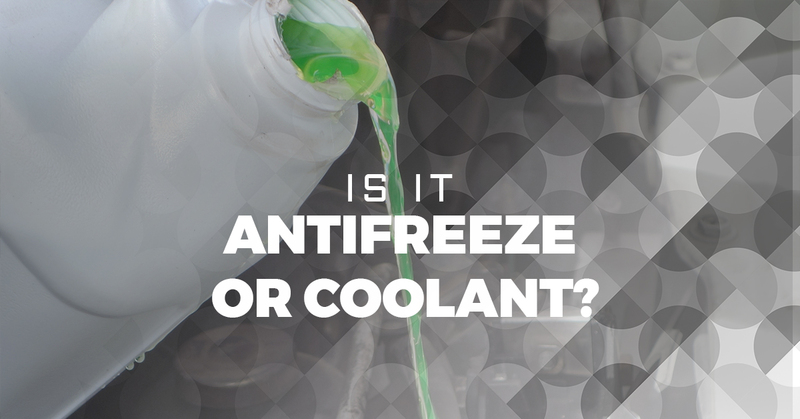 Is It Antifreeze or Coolant? The flash of a dash light gets your attention and all of a sudden your day is taking a turn for the worst. The car begins to smoke and the driver pulls to the side of the road, sickeningly sweet smelling smoke rolling from the engine compartment. The temperature gauge of the vehicle is maxed out and hovering in the red, an ominous warning to the driver to shut down the engine immediately. But we live in Iowa and it is a blustery 21 degrees with a windchill of 10 degrees, you don’t necessarily need to worry about the same situation happening, right? Wrong! Through excessive clouds of smoke, the driver opens the hood and disappears into the haze. This is the portrayal of what could happen to your car if it overheats. Unfortunately, vehicles can overheat in any weather and the main deterrent from engine damage and becoming stranded is coolant. Now you may be wondering what we are talking about, is it called antifreeze or coolant? Technically, they are both the same, it just depends on who is doing the talking. Engine coolant has a primary function of regulating engine temperature and preventing an overheating situation. So how dose that sticky green fluid in your radiator help prevent overheating? In reality, coolant is only a part of the entire vehicle cooling system. Of course like any system, without all of the parts functioning at full capacity the chance for failure, and overheating, increases. Back in the old days, coolant was designed to vent from the system and necessitated filling the coolant often, which is why cars in the ‘20s always were depicted with smoke coming from the hood. Modern coolant is composed of a wide range of additives mixed with water and is housed in a closed system that prevents coolant loss. The main function of coolant is to absorb heat off of different parts of the engine and transfer that heat to the atmosphere. In order for this process to work, various parts need to be included. The main parts of the cooling system are: the water pump, the radiator, the heater core and the thermostat. Each of these parts contains coolant and functions to reduce the amount of heat that is allowed to remain in the engine. Coolant passages in the engine are specifically designed to remove heat created by combustion and keeping the engine at optimum operating temperature. To regulate this temperature, a thermostat is placed inline and programed to open when the coolant reaches the target temperature. After the coolant passes through the thermostat the coolant is carried to the radiator where the heat is dissipated and the coolant returns to the engine ready to carry away more heat. Now we know what you are thinking, this is all very interesting but what does it have to do with my vehicle? Keeping your coolant in the best possible condition is critical to extending the life of your engine. Depending on the manufacturer’s recommended service guidelines, the coolant should be periodically changed and the system cleaned out. At LOF-Xpress™, in addition to our incredibly fast oil changes, we offer a complete coolant system flush and fill. This completely changes the coolant and ensures that the protection level is right where it needs to be to withstand freezing Iowa nights and scorching summer days. A flush cleans out the scale that will form inside of the system, as this scale can block critical coolant passages. Of course our flush and fill service is in addition to our oil change service and there is never any pressure for you to include any of our additional services. We know you are busy and generally are interested in getting an oil change as fast as possible so you can get on with your day. That being said, at LOF-Xpress™ we care about each and every one of our clients AND their cars and we will always keep you informed of proper maintenance schedules. So whether you have five minutes or three hours, stop in anytime to LOF-Xpress™ and we can get you in, out, and have you on your way. As always, we look forward to seeing you, no appointment ever needed!